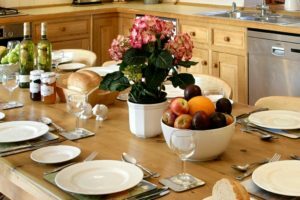 Information to help with your cottage booking! We have prepared a list of frequently asked questions, but if there is anything else you need to know please contact us and we will be happy to help. Arrival time: What time can I arrive and depart? In order that your accommodation can be properly prepared the normal arrival time is 3.00 p.m. and the departure time is 10.00 a.m. However please contact us if these times are not suitable and we will endeavour to meet your requirements. Bed and linen: Will the beds be made up on arrival? All the beds are made up for your arrival, with sheets and duvets. Further blankets are provided in the wardrobes. The duvets and pillows are wash and bounce non allergic hollow fibre. In the airing cupboards are hand towels, bath towels and bathmats. Tea towels and kitchen hand towels are provided in the kitchen. Guests staying more than 2 weeks will have a weekly Friday service clean where towels and linen will be replaced. 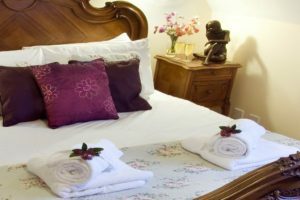 If you would like to have a more frequent change of linen and towels this can be arranged at £20.00 per person per day required. Booking: do all the bookings start and end on a Friday? We change over the cottages on a Friday, so we tend to book the cottages to coincide with this. However if you would like to book a week that doesn’t start on a Friday that is possible but there may be a surcharge. Short breaks can be taken to start on any day and no surcharge will be incurred if the departure day is on a Friday or before. Booking, do I have to use the online form to book the cottage? If you are having trouble or just do not like to book online please ring 01295 770637 or email us. We can complete the form and payment for you over the phone. You can also pay with credit or debit card or post a sterling cheque. We are open all year, but it is especially great to be here at Christmas. The cottages are festively decorated with Christmas trees, holly door wreath, Christmas decorations, crackers, home-made mince pies, and Christmas tea towels. Taxis Services: Can you recommend a good taxi service? We do have some very good taxi services for the cottages. We would advise you book them in advance of your stay. Weather in winter: do the cottages ever close? We are open all year and have never been closed due to bad weather. The end of the farm drive is a school bus route, so generally the road by us is gritted and clear at all times. The farm cottages are cosily heated by gas central heating, which is included in the price. They will be warm and cosy for your arrival. What if it rains? We have loads of books, puzzles and DVDs in the cottages. Many of the local visitor attractions are open all year and cater well for those rainy or cold days – please see our Things to Do page. Why not bring your wellies and have a good splash in a puddle, there is nothing better! Welcome Pack: what is included? We pride ourselves on our lovely welcome pack. We provide chilled wine, fresh milk, tea, coffee, fresh flowers and home-made chocolate biscuits cooked by the farmer’s wife. In the kitchen we provide, tea towels, kitchen towels, kitchen soap, dishwasher tablets, washing up liquid, washing up brush, cloth and sponge, bin liners, salt and pepper. In the airing cupboards we provide Bath towels, hand towel and bath mat and spare toilet rolls. Wifi and phone: do you have free wifi and good phone connection? We do provide free country speed, Wifi access and generally have a good mobile phone service at the cottages. There is a pay phone in the village 200 metres from the cottages. Supermarkets and shops: do you have shops nearby? Do they deliver? Our local Co-op is 2 miles away and Tesco is 4 ½ miles away Kineton Rd Industrial Estate, Southam CV47 0FG. We are very lucky to have Tesco, Ocado, Sainsburys, Asda all who will deliver to your cottage door. We have a Post Office in Bishops Itchington 2 miles away. Newspapers: can I have papers delivered? Yes, they are The newsagent is at Bishops Itchington, 2miles away, (01926 612 387 01926 612 387). It is situated the second turning right, after the garage. They will deliver to the cottages normally before 7 a.m. Please could you pay prior to departing home. Are there any general markets nearby? Do you have any Farmers Markets nearby? Yes, they are a great place to get fresh and organic food from our local farms. Are the owners situated nearby? On the farm where the cottages are situated is the farm house in which Fiona’s mum, Anne lives. Craig (07767 833592) and Fiona (07799 005383) live in the village, close enough to be on hand but far enough to give you space. Car parking: do you have plenty or parking? We have plenty of parking. You can park outside your cottages or in the car park area nearby. If arranged in advance we also have space for large vehicles and vans. We try to provide all the utensils that you would have in your second home. Electric oven, gas hob, dishwasher, washing machine/ tumble dryer, mixer, food processor, scales, selection of utensils, spoons, plates bowls, glasses serving dishes. Smoking. Can we smoke in the cottages? All our cottages are strictly no smoking. However you are more than welcome to smoke outside the cottages and we provide sand pots for your cigarette butts. Sorry we don’t accept pets as we have guests that stay with us who have allergies to pets. We are also unable to accept pets to visit at the cottages. We have a rescue dog that lives with Anne who loves people but unfortunately hates other dogs! Doctors and Emergency Services: Can I register with a GP practice when I stay at the cottages?